Remember that time when the heart overflowed with feelings, and words never seemed to be enough? 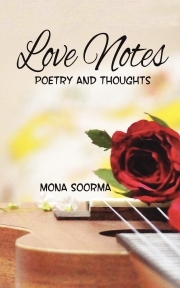 "Love Notes", a book of micro-poetry and thoughts by Mona Soorma a.k.a. Manic Sylph is a collection of eternal moments caught forever in ink, to be taken out on a quiet evening and read at leisure, or to be hidden in a tiny note and shared with a loved one. Divided into 6 sections- Pleasure, Pain, Love, Desires, My beautiful Lover and Towards A New Dawn, there is something here for every mood and emotion. Meant to be enjoyed, one random note at a time, or all at once, if you wish to drench in it, it is sure to play your heartstrings to perfection. Mona Soorma has been writing under the pen name of Manic Sylph and has a substantial online following on all major social media platforms. Positivity is her second name, and her favourite kind of day is one filled with creativity, smiles, animals and food. She loves poetry and photography, and is always ready to learn something new. Not a day passes by when she is not connecting with her readers on the social media, they are the real stars in her skies. You can contact her on her website www.manicsylph.com You can also find Mona Soorma on google or manicsylph on your favourite social media platform.